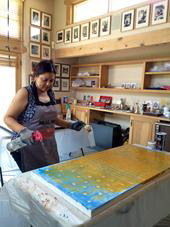 SAR is now accepting applications for three artist-in-residence fellowships designed to advance the work of mature and emerging Native artists. The application deadline is January 15, 2018. The Dubin Fellowship is dedicated to supporting traditional Native artistry. The King Fellowship is dedicated to preserving the Southwest. The Dobkin Fellowship encourages the creativity and growth of indigenous women artists working in any media. An informational flyer can be downloaded here.